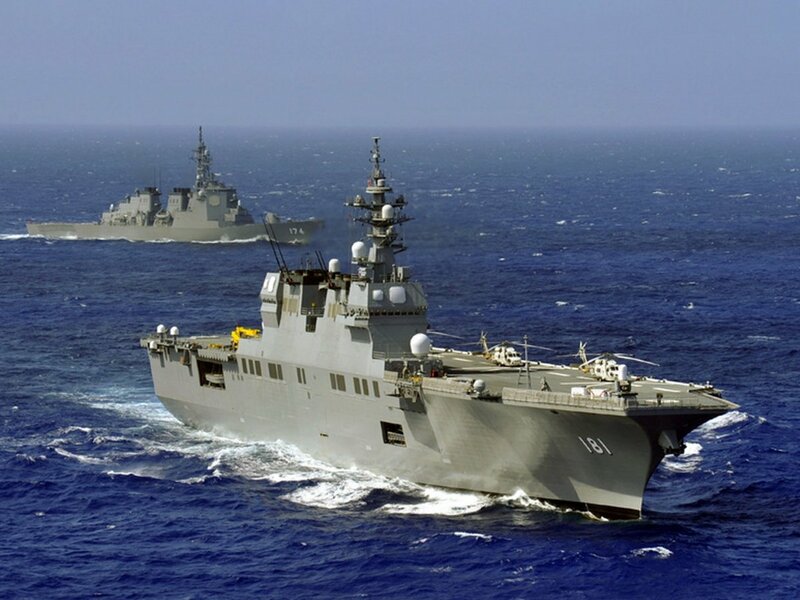 The Hyuga class carriers are officially dubbed "Helicopter carrying Destroyers" for political purposes, but they are clearly Anti-Submarine Warfare (ASW) aircraft carriers. This was punctuated in 2013 when US Marine V-22 Osprey aircraft cross decked onto the Hyuga and performed qualification testing. It has been often rumored that these vessels could embark new, Joint Strike Fighter (JSF) F-35B aircraft that the Japanese would like to buy from the US. However, though the vessel's decks are certainly large enough, numerous changes would have to be made to allow for this. These changes include relocating the forward 20mm Phalanx CIWS mount so the deck would be clear for the STOVL roll of the F-35B, strengthening/treating the flight deck to withstand the jet blast of the F-35B, and rearranging the hanger in order to be able to work on and maintain the aircraft. These would represent a significant cost, and therefore it is not expected that the JSF will be embarked the JSF on the Hyuga Class. However, a follow on class, the 22DDH vessels, which are 7,000 tons larger, over 100 feet r, and with a large deck edge elevator and a clear flight deck to the bow, are better candidates. The JMSDF Hyuga, DDH-181, was laid down in May 2006, launched on August 23, 2007, and commissioned into the JMSDF on March 18, 2009. Her sister ship, JMSDF Ise, DDH-182, was laid down in May 2008, launched on August 21, 2009, and commissioned into the JMSDF on March 16, 2011. In addition to her numerous ASW and SAR helicopters, the Hyuga is well armed for it's role including a 16 cell Mk-41 VLS System that will carry 8 vertically launched anti-supbamirne missiles, and 32 (quad packed) Evolved Sea Sparrow Missiles (ESSM) for anti-aircraft and anti-missile defense. In addition, each ship is armed with two 20mm Phalanx close in weapons systems (CIWS) for anti-air, anti-missile, and anti-surface defense, and two triple 324mm torpedo mounts for close in ASW defense. Numerous 12.7mm (.50 cal) machine gun mounts are located onthe catwalks and auxillary decks around the flight deck for repeliing small craft and boarders. The vessels are also outfitted with a sophistiacted Japanese self defense system consisting of an FCS-3 Phased Array Radars (APAR) and an integrated ATECS computer/defense system. This integrated system is somtimes referree to as the "Japanese AEGIS" system, referring to the AEGIS system employed by the United States Navy and several other navies (including the JMSDF Atago and Kongo class destroyers), and to which it is fully compatible and capable of sharing information, targeting, command and control. 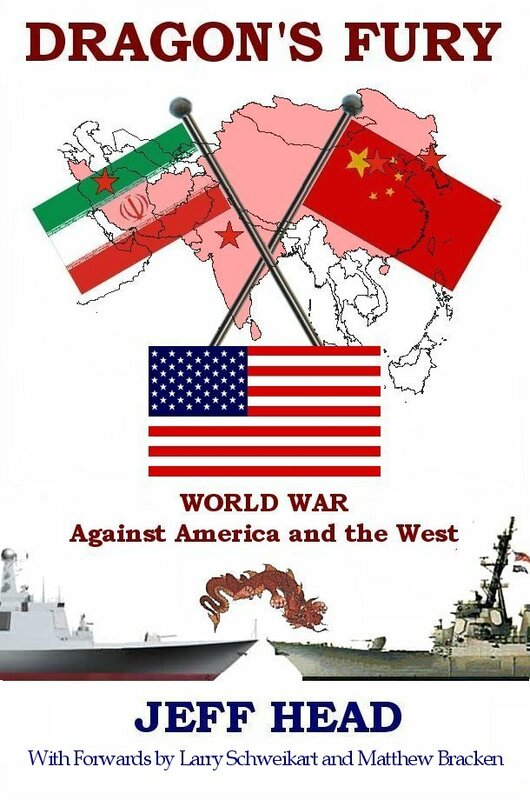 The role of these carriers is first and foremost to operate as the center piece and task force leader of a large Anti-Submarine Warfare task force of the Japanese MAritime Self Defense Force in pursuit of Japanese national interests and defense. In such a role, the Hyuga will typically carry 6-8 very effective ASW helicopters, SH-60K Sea Hawks, to operate off of the carrier to complete this task. They do so in conjunction with up to four other JMSDF guided missile destroyers or guided missile frigates, each of which woill aslo carry it own ASW helicopters. In this manner, such a task force can "sannitize" an area of ocean to ensure that the submarine threat is kept well at bay away from the task force itself, or away from capital vessel task forces like US Navy aircraft carrier strike groups. In addition, the Hyuga class is outfitted to carry a contingent of Japanese Marines and land them by helicopter in troubled spots as required, either for defense purposes, or in answer to disaster as humanitarian efforts. Both carriers were very involved in helping in northern Japan after the earthquack and tsunami disaster which struck Japan in March of 2011. These carrier and their escorts regularly train and exercise with US Navy and other Western Pacific and allied nations navies like Australia, the Philippines, the Royal Navy, France, etc. During such training, helicopters, and, as stated, even larger aircraft such as the V-22 VTOL Osprey operated by the US Marines, cross deck and operate off of the Hyuga carriers. Until the introduction of the larger 22DDH vessels in 2014-2016 time frame, the Hyuga class will continue to represent the flagships and largest, most sophisticated vessels in the Japanese Maritime Self-Defense Force. 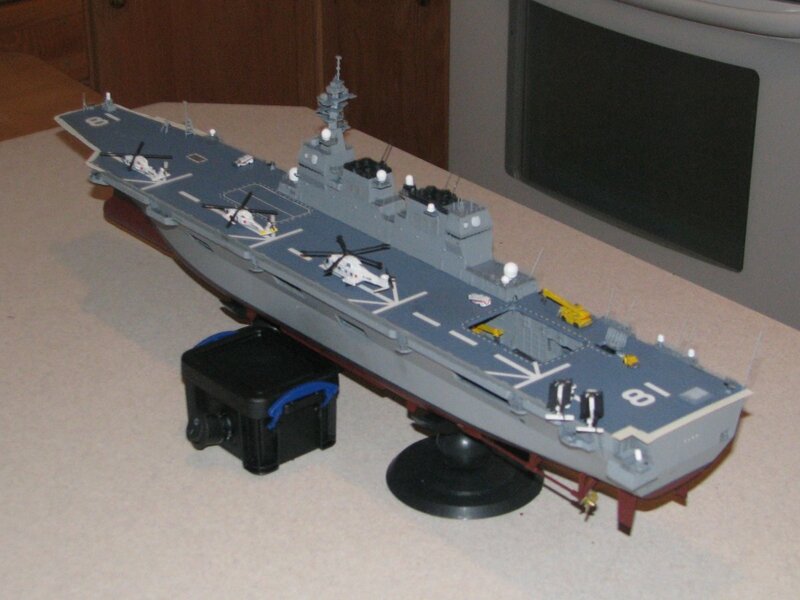 The 1/350 scale Fujimi Hyuga aircraft carrier in 1/350 scale (kit #60011) was announced in 2011 and came out in 2012. It is a new model and Fujimi is well known for its quality productiona and modern manufacturing techniques in producing its quality models. I saw this kit available on a Japanese model site as a pre-order special before the model was available in Japan, and long before it became available in the United states. The price was $125 dollars US plus shipping. I immediately bought it. Currently in the US this vessel is going to retail at a minimum of $229 and in many places is upwards of $300. They can still be purchased from Japanese sites for the best price for aorund $150 doillar (for example at Hobby Link Japan - http://www.hlj.com/product/fuj60011). 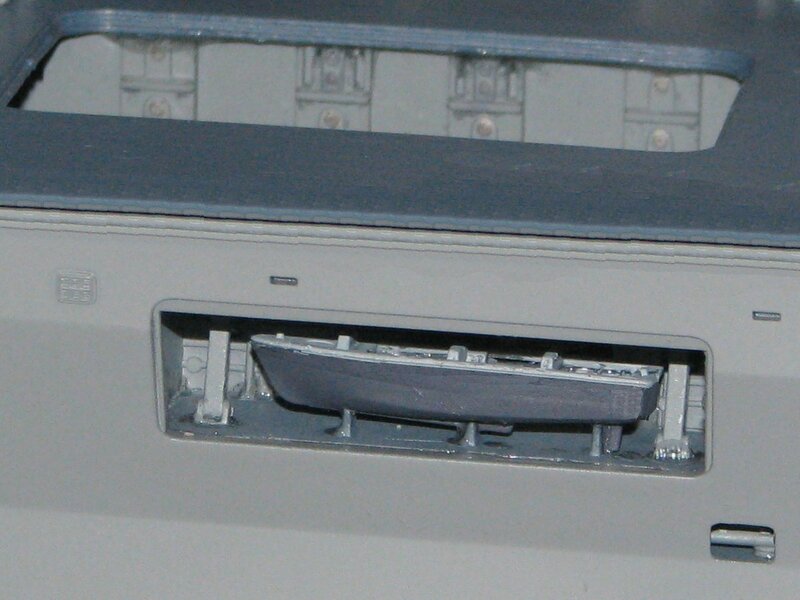 Inside the box, you find that this is a full hull model (no waterline option other than to cut it) that comes in three parts, the port, straboard, and aft sections. These are well molded and have very accurate details, including the numerous venting locations and auxillary decks. The vessel is also manufactured with fouteen cross member supports inside the hull to ensure that the fit is very good between the hull halves, and that the vessel is very stiff and sturdy. There are fifteen sprues of parts. 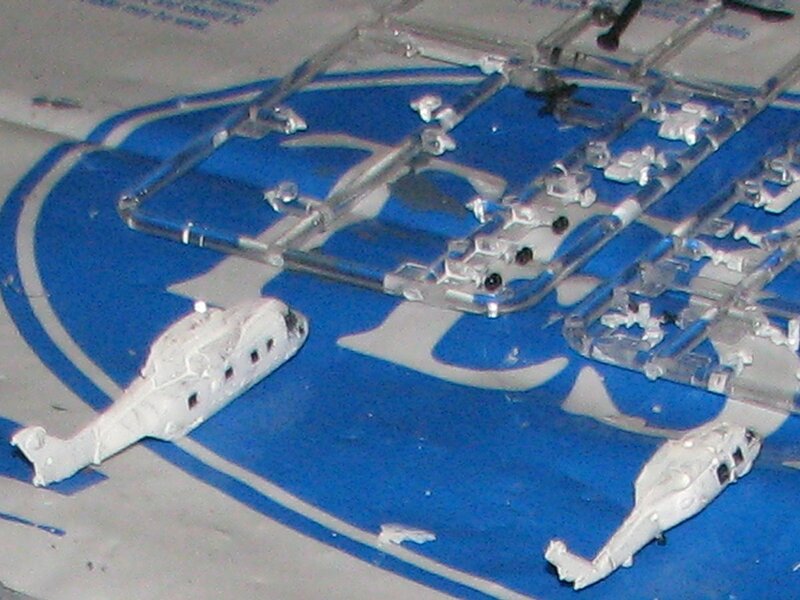 These consist of eight sprues of plastic parts molded in gray for the vessel itself, four sprues of parts molded in clear plastic for four JMSDF helicopters (1 x UH-60J, 2 x SH-60K/J, 1 x MCH-101), one sprue of photo etched metal parts (which consists entirely of 39 vents to be located around the hull and superstructure...sadly, no railings, netting or sensors), and two sprues of plastic parts molded in black and silver for the stand. There are two full length halves to the hull, and the flight deck is a single piece, running the full length. All in all, there are over 420 parts to this model. A very good set of waterslide decals with over 80 decals is included which covers all of the flight deck markings, all of the aircraft markings, and the pennant numbers and various hull and superstructure markings. 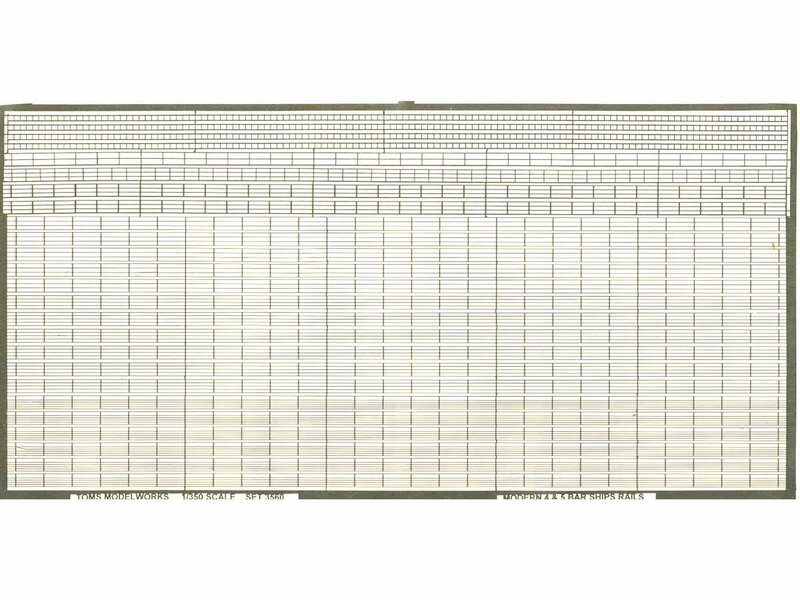 There is a very large (significantly larger than 11x17 sheet size) full-color sheet of the Huyga in five views for painting, including several of the most common paint suppliers part numbers for the paint. The instruction sheet is intuitive...and that is good thing because it is entirely in Japanese. But it does not appear to be an isuue because it is pretty clear how the vessel goes to gether and the numbers and grpahich representations makes it clear what part goes where and how. This model looks very good. 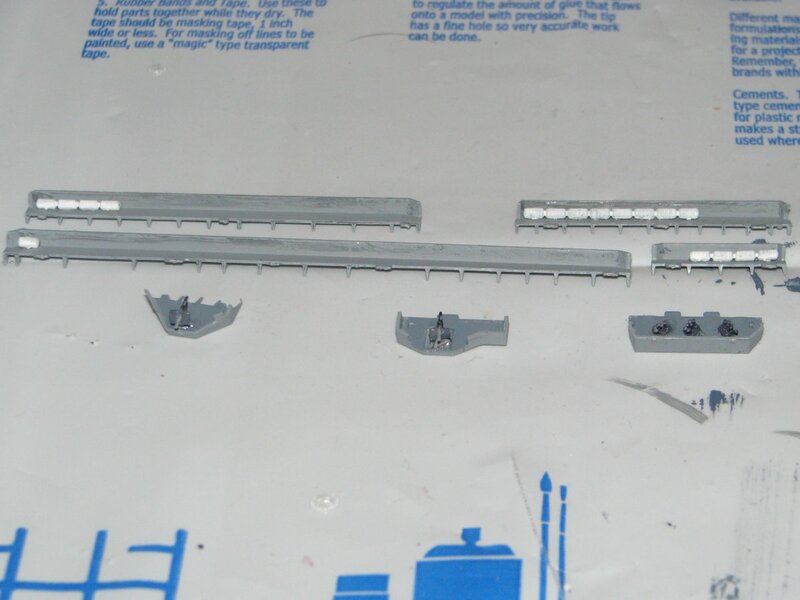 There are many finely detailed parts, including sensors and the .50 cal guns and their mounts and shields that appear well enough done in plastic to preculde the need for photo etch parts of r those pieces. 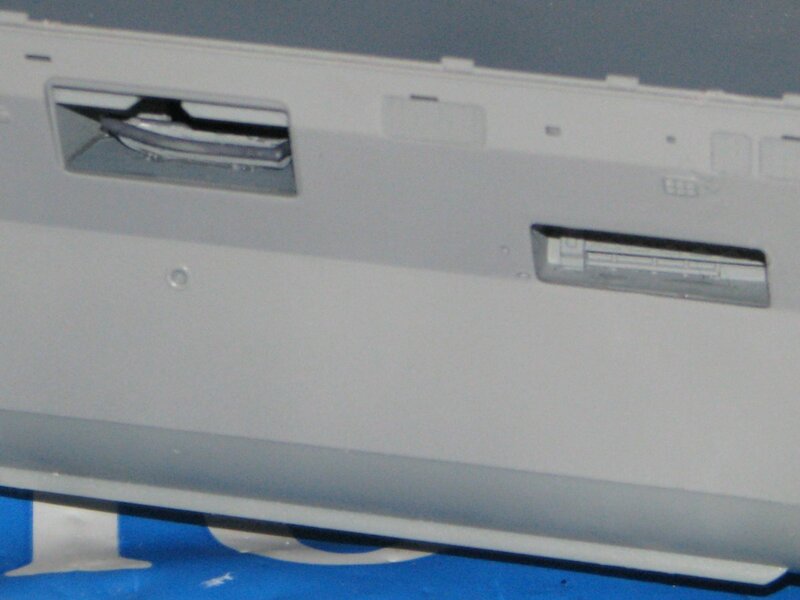 However, the railings are non-existant, and some of the plastic ladders, while relatively fine tooled for plastic, are still not up to a photo etch replacement part. For this reason, I ineted to purchase a couple of 1/350 scale railing photo etch kits from Tom's Model works, and also use a 1/350 scale ladder kit I already have. I believe I have enough safety netting to cover this left over from other builds, but if necessary will buy more of that too. Finally, I intend to install a lighting kit in the hanger for this model. This will netail changing the hanger as provided. The model provides two fairly detailed secitions of the hanger, but they are individual square sections right around each elevator. I intend to extend the hanger deck and the walls between these two sections and detail and light the whole thing. 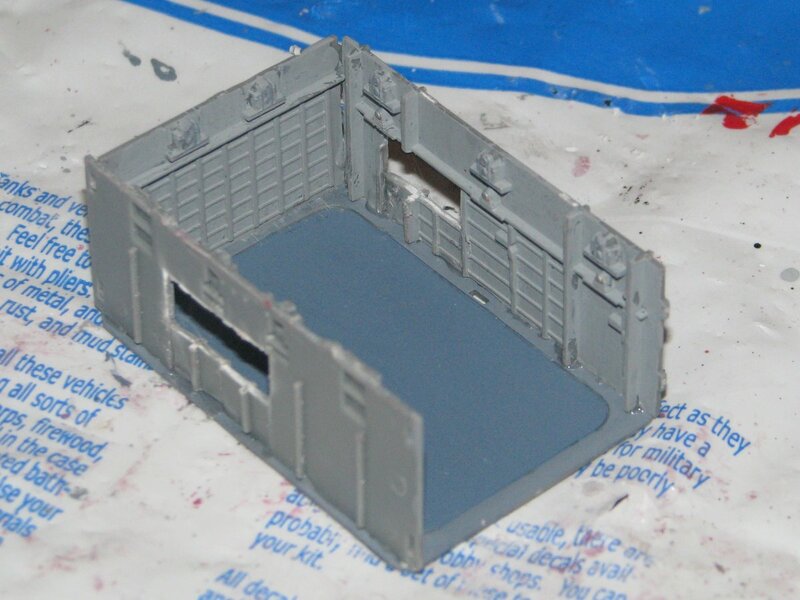 I will also see oif I can cut and install passageways between the auxillary decks on the port and starboard side into this hanger space so the hanger lighting and detail can also be seeon from these openings, similar to the way I did with the Airfix 1/350 scale model of the HMS Illustrious, R06. 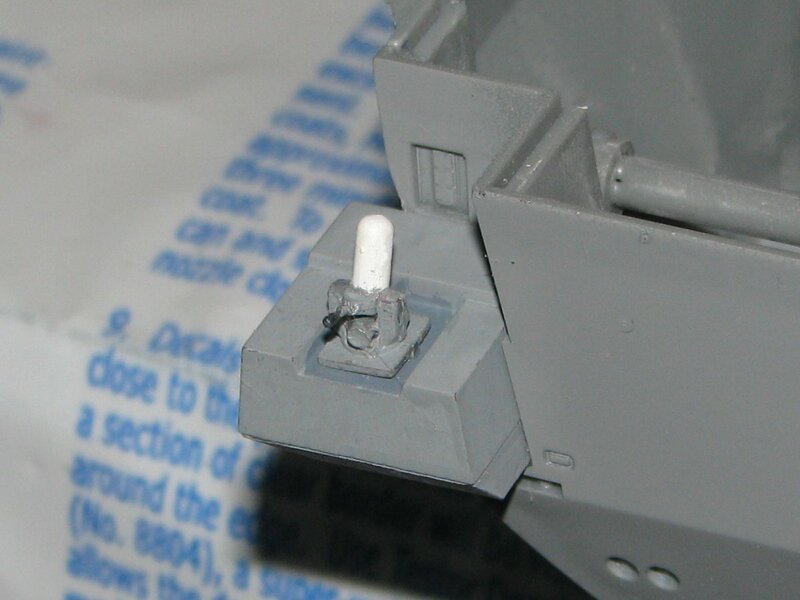 Alright, this kit appears to have been very well engineered and manufactured for completing a full hull that is an extremely good fit, and that will be very sturdy for placing all of the other sections of the model onto it. 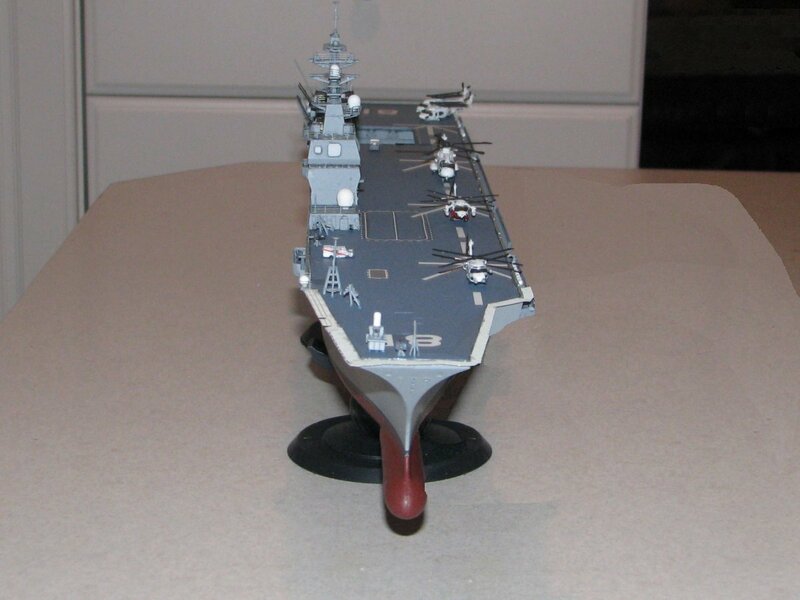 In this regard it is a much better design than the similarly modled Airfix 1/350 scale HMS Illustrious, which is a vessel of about the same size. 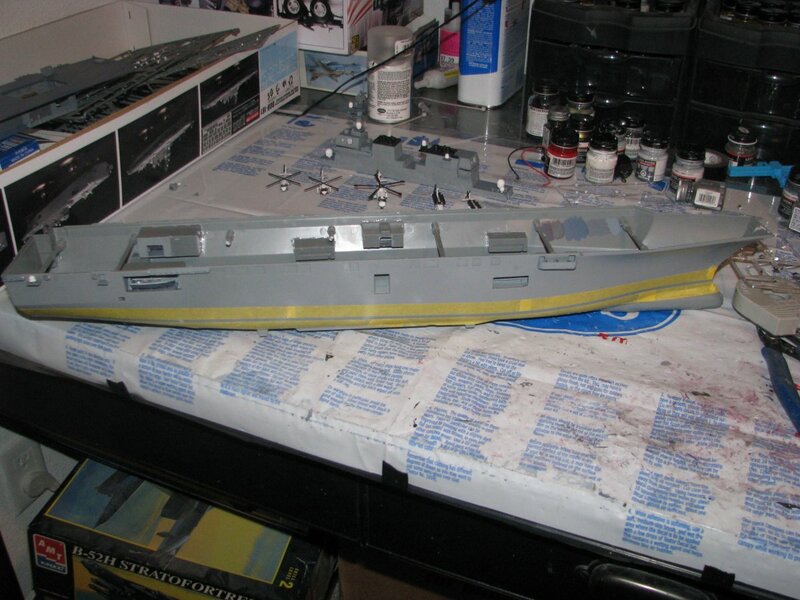 I decided to put the hull together first so I would be prepared to paint the whole thing in the Nuetral Gray color I intend for all vertical surfaces, and then mask off and paint the waterline mark in flat black and the red lower hull later. This involved glueing the 14 cross members into one side of the hull to begin with. The important thing here is to make sure that those pieces are firmly placed and bonded, but also come out straight from that hull half so they can then be fit easily and accurately into the other side when putting them together. So, I did so on the first side. After letting them dry overnight, it was time to glue the other side to this assembly. This went very well. I did a dry fit fort, then took it apart and applied glue to the other half and to each of the cross members where they would fit into the holes on the other hald. Then, working from the bow to the aft, ensuring that each cross member fit into its respective hole on the other hull half, I put the two sides together. Once they were together, I used four clamps to secure a tight bond and fit, and let them dry accordingly. 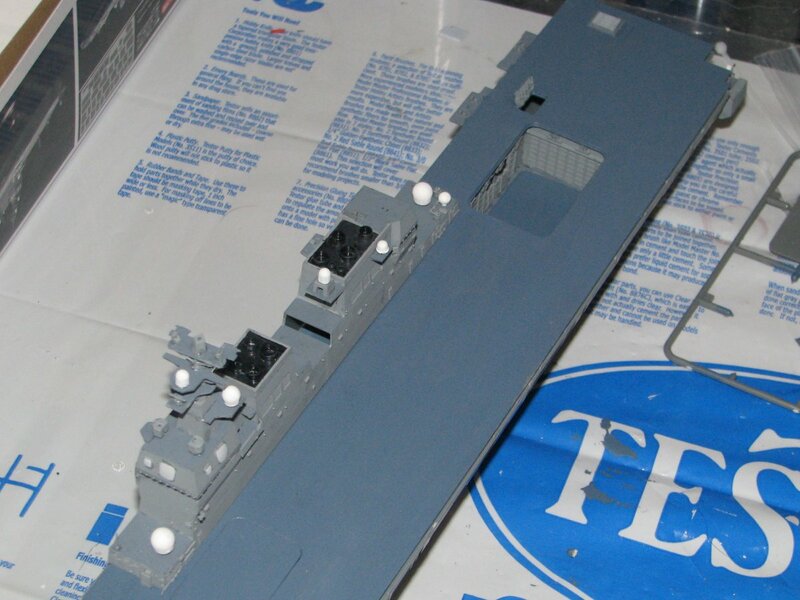 And there you have it, the intial hull build for the 1/350 scale Hyuga. 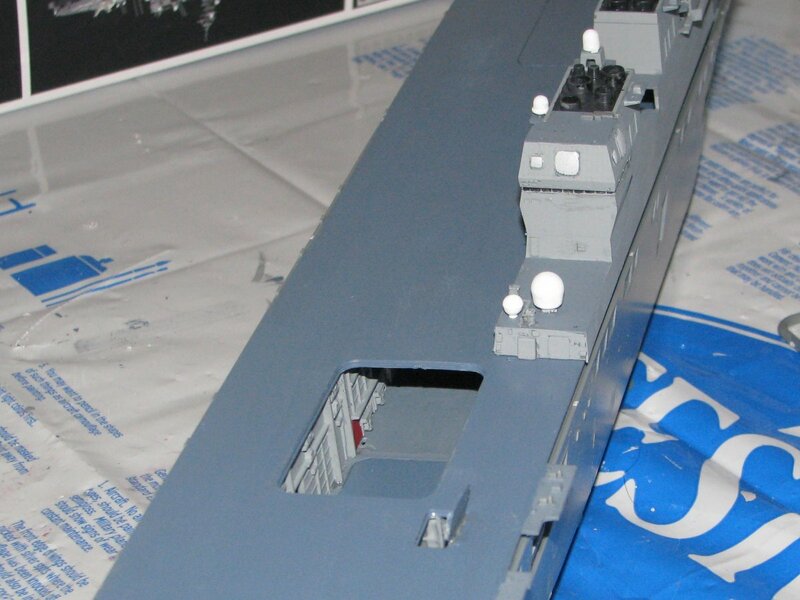 I will continue through the upcoming weekend with doing all of the initial painting of the various decks and pieces, the weather decks in a flat gray, the flight deck in a flight deck gray, vertical surfaces in neutral grey, radar domes and life rafts etc. in white, guns in dark gray, windows in weathered black, and various sensors and other gratings and what not in steel. I also hope to do the assembly of the various auxillary decks and decide where to cut the p[assageways for seeing into the hanger. Got a lot done over the last five days. Was able to spend quite a bit of time this weekend. 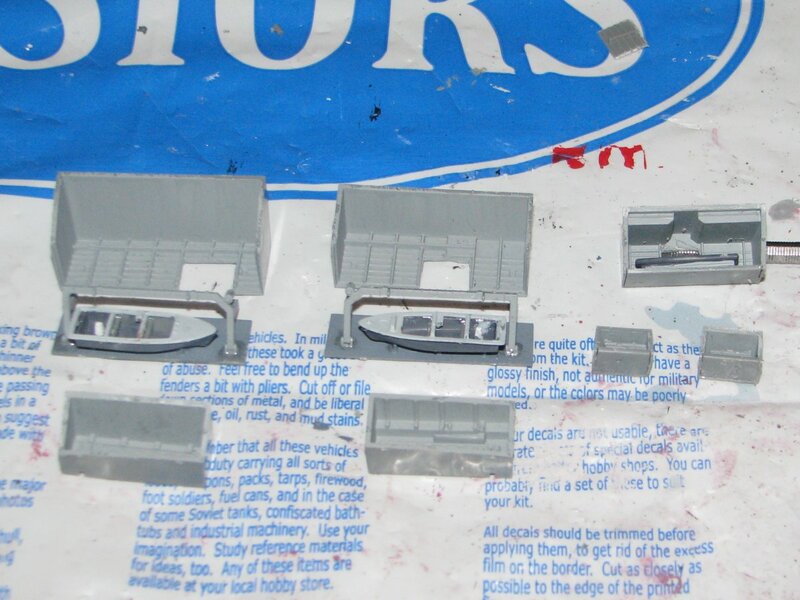 So, I painted the various parts on their sprues the various standard colors I am using for the JMSDF. Vertical surfaces in Neutral Gray, the large flight deck in flight deck gray, the weather decks in flat gray, the radar domes and life rafts in flat white, light gray for the APARS, and flat white for the JMSDF helos. Smoke stacks and waterline mark, and windows/canopies in weathered black. All of them, except the weathered black are Model Master paints. Once this was done it was time to begin assembling the island and the various auxillary decks which contains the ship's launches, gangways, etc. The aft two of these I cut viewing passage ways into so the hanger deck will be visible in them. I also began building the Island, the hanger bay, and the lighting system for the hnager bay that I intend. 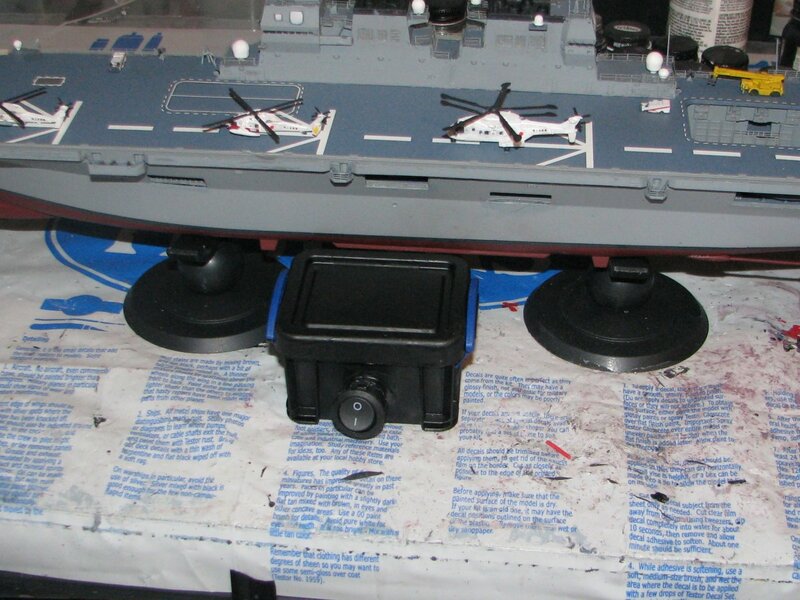 In addition, I included the starboard aft quarter CIWS deck and the Phalanx weapon system located there. The island is made up of a lot of pieces. The assemblies for the JMSDF APARs (which includes two seperate APARs in each quarter panel facing in each of the four directions) for both bands covered. The superstructure on top of the forward section of the island includes a LOT of small intricate pieces. 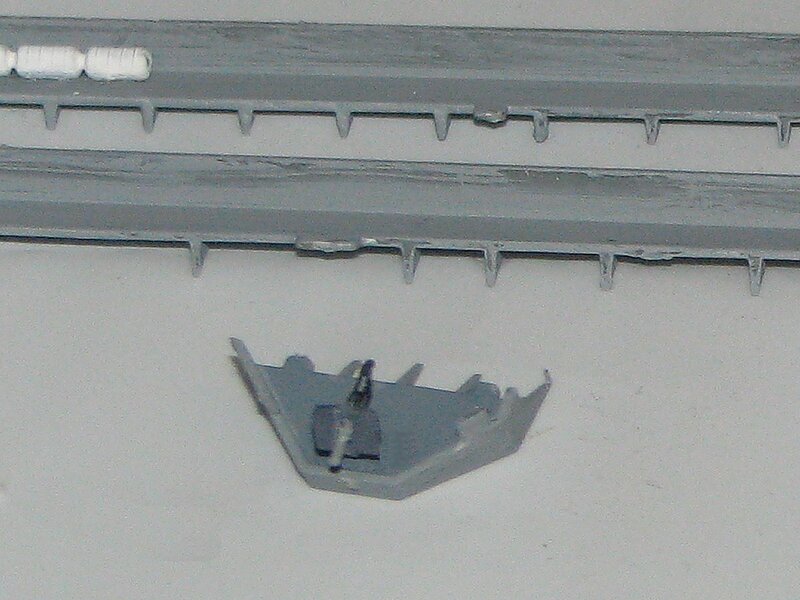 Each of the various deck supports is included as very small, very delicate plastic pieces. These must be handled with care to avoid breaking them because they are so delicate. Howerver, they are well molded and negate the need for photo etch parts that would otherwise be used to show this level of detail for the supporting structure for those decks. 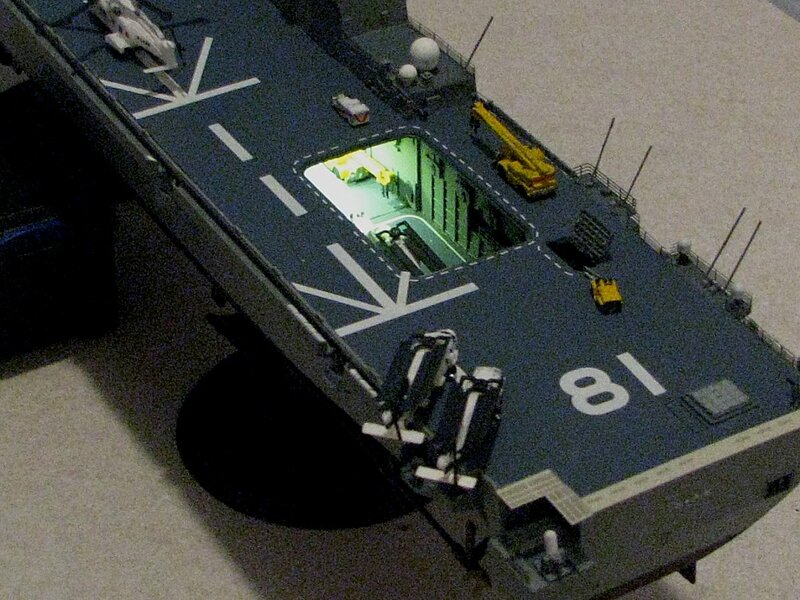 The hanger bay in this kit is made up of two enclosed, rather detailed areas right around the two elevators. I decided to show the forward elevator in the raised position, and the aft, larger elevator in the lowered position. 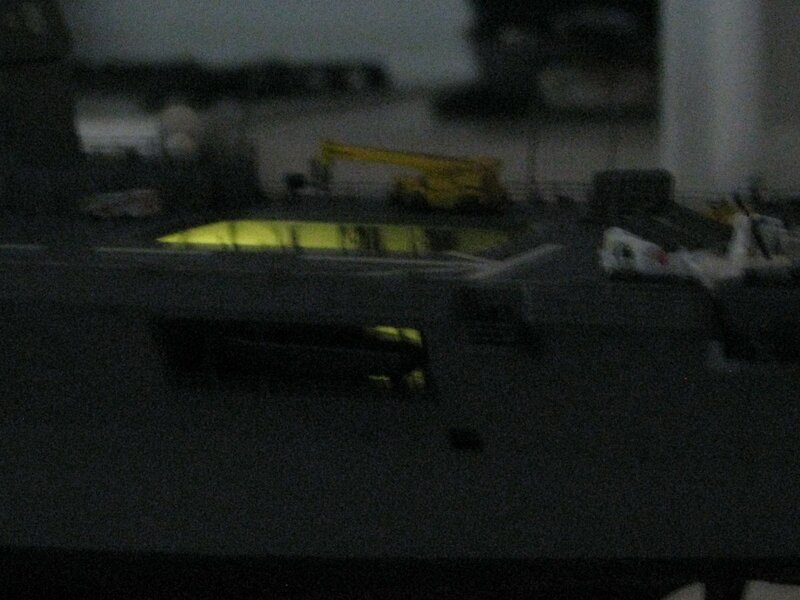 I then decided to scratch build the hanger deck forward from the aft elevtor (probably a good 150ft or more in scale) and put a lighting system in this area. The following pictures show these various assemblies. 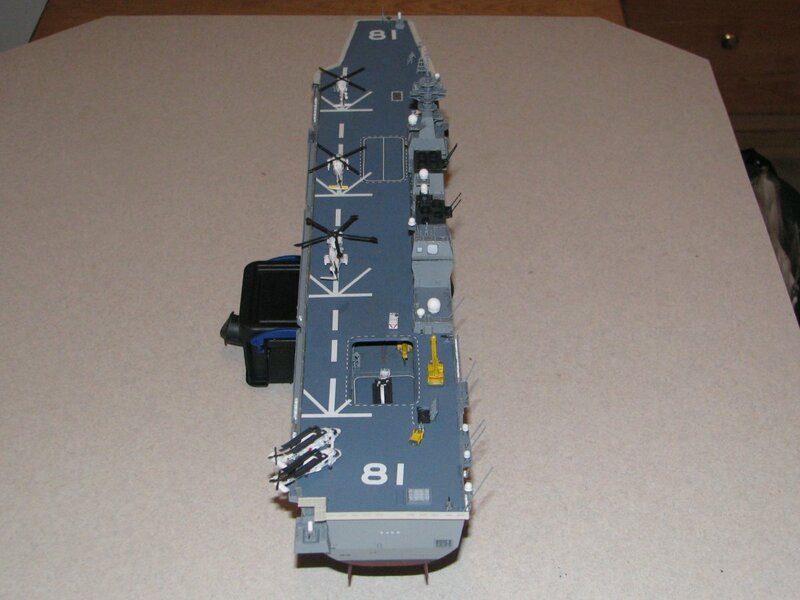 Once these parts/assemblies were to this point, it was time to install all of the auxillary deck openings into the hull, and to dry fit the island and hanger deck (with its lighting system) onto the hull. Fitting the hanger bay as I built it, including the approximately 150 ft section forward of the aft elevator, required that I cut two of the upper cross member supports I had installed earlier. This allowed the new assembly to fit nicely. After this was completed...and looking pretty good I might add...it was time to start building the various walkways around the flight deck which include most of the life rafts, and the other small decks and stanchions that protrude from the hull just below the flight deck containing the .50 caliber (12.7mm) machine guns and decoy, chaff ejectors. 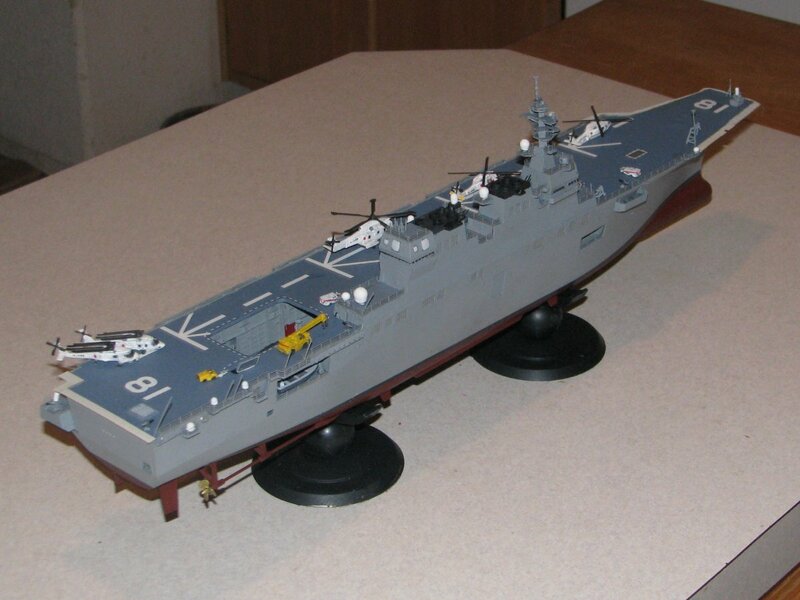 The Fujimi model contains many, many very small and delicate pieces, as stated and referred to above. This includes the .50 caliber machine gun tripods and armored deflectors. They are small, very delicate, and negate the need for photo etch parts (IMHO) in these areas. So, that does it for this session. 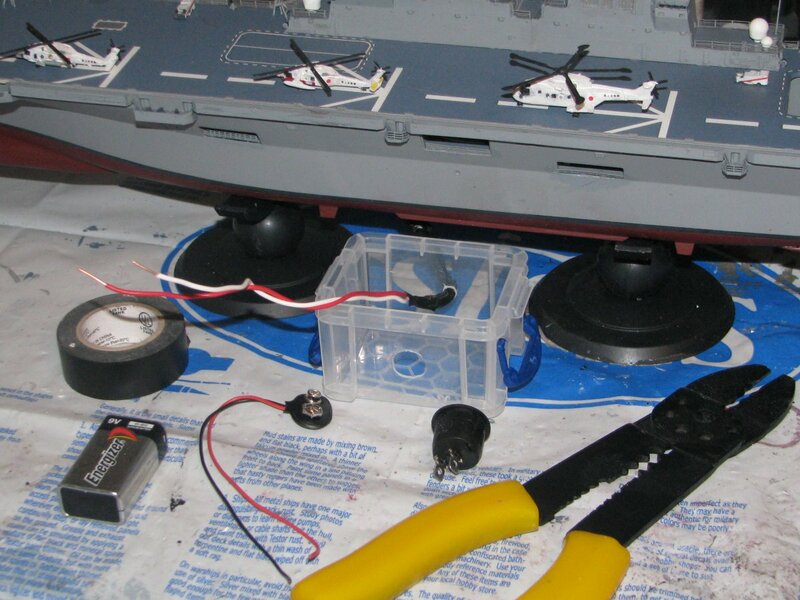 In the next session, I hope to get all of those walkways, small decks, and hanger bay helos placed, glue down the flight deck and island, finish more details on the flight deck and island, and paint the lower hull while adding the props, screws, and rudders. That will leave me with putting on the decals, finishing and placing the airwing on the flight deck, putting together the stand and switch for the lighting system and completing the model in the session after next. Ok, things really started coming together this last week. 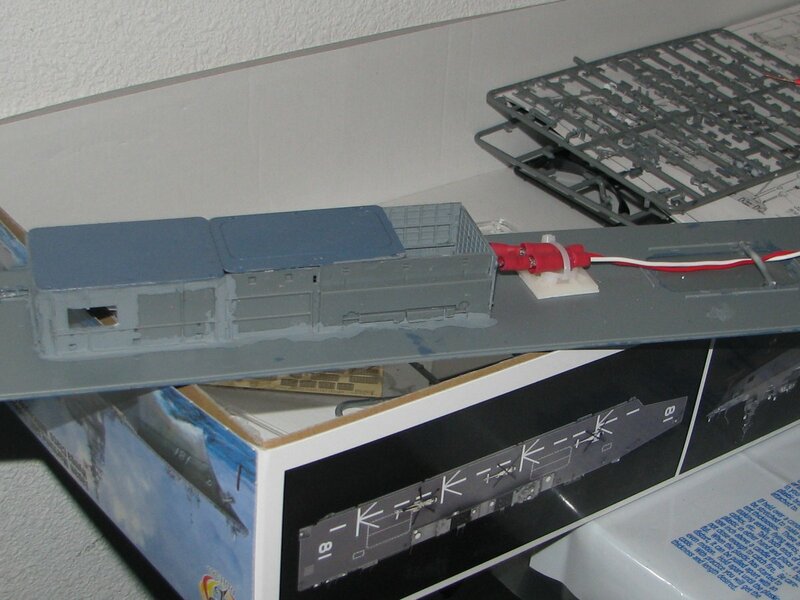 First, I added all of the walkways and small decks around the hull, including the chapp launchers andmaching guns located aloing the port side. 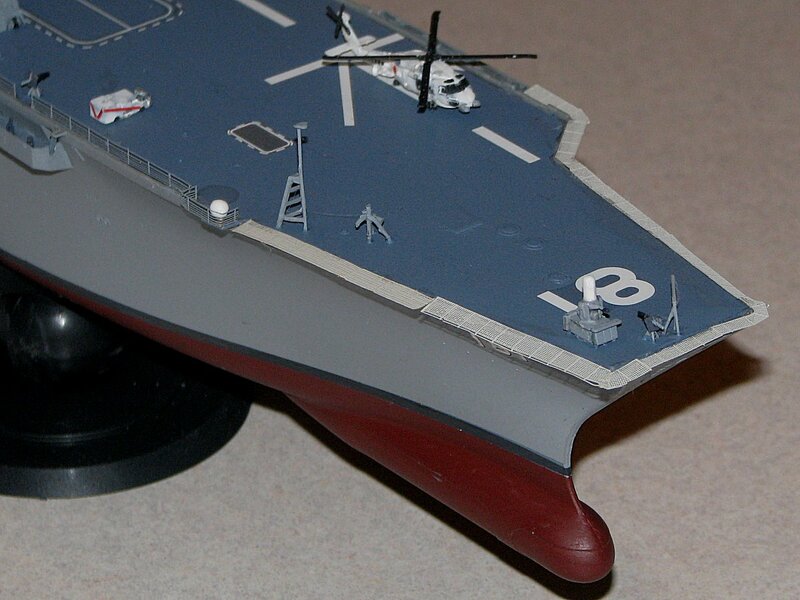 I then went ahead and painted the lower hull, adding the waterline mark and the lower hull in hull red. Then it was time to add the flight deck, and add the decals to it. The flight deck really fit well onto the upper portion of the hull. 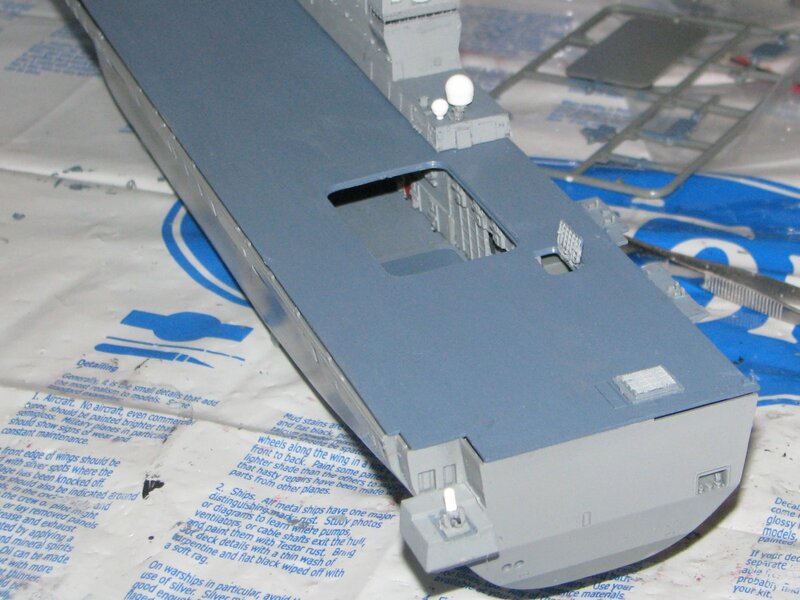 Fujimi did a good job with the recessed ledge all the way around the hull that the deck fit nicely into, and I am sure those stiffiners Fujimi included helped greatly in this regard. I used some clamps to insure a tight, flush fit until it dried. 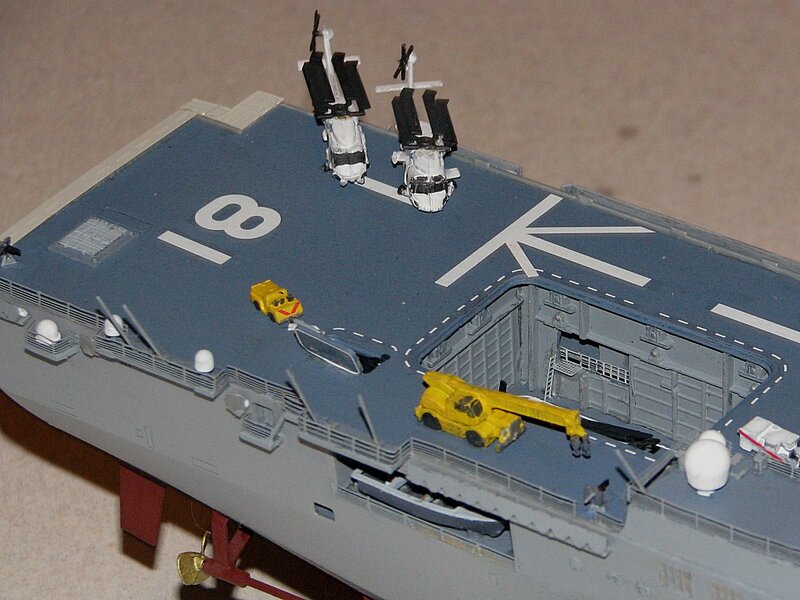 Then it was time to add all of the decals on the flight deck. They are quite numerous. A word to the wise. The elevator decals are not single pieces of decals material. They are decals just along the lines, so when they slide off, unless you are prepared in advance, they easily get tangled and tear. The thing I did, and I recommend, is to cut them into quarters and then slide them on and fit them together. This helps significantly in avoiding the tangling and tearing problem. Once the decals had dried well, I sprayed the whole model with my first coat of clear dull coat. This helps even up the glint/color quality and seals the decals. 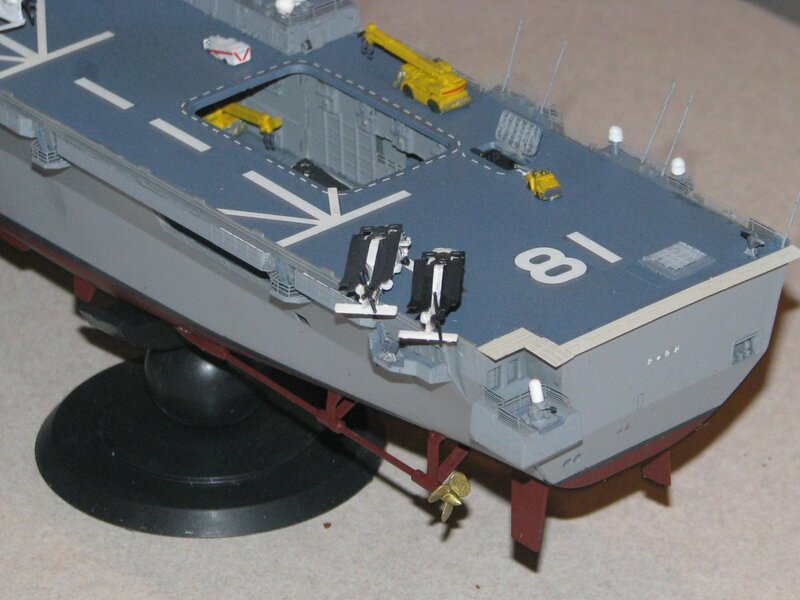 Then I added all of the significant details that the Fujimi kit offers on the flight deck like the Phalanx CIWS at the bow, .50 cal (12.7mm) machine guns around the deck, and numerous antennae and other details. I then did the same (added the numerous remaining details) to the island including all of its antennae, additional sensors, etc. Once all of these had been added, I then added the flight deck aircraft which I had built earlier. This included three helicopters in the take-off position (an SH-60J, a UH-60J, and the MCH-101) and two helicopters parked toward the port aft quarter (2 SH-60Ks) and all of the deck equipment (tugs, cranes, etc.) including a small cart with a warshot torpedo on it being pulled by a tug which I placed next to the open weapons elevator hatch. I built a small enclosure below it and glued it to the lower surface of the flight deck, painted black inside, to allow for a good loook inside the weapons elevator space from above. Okay, the final steps took some time. 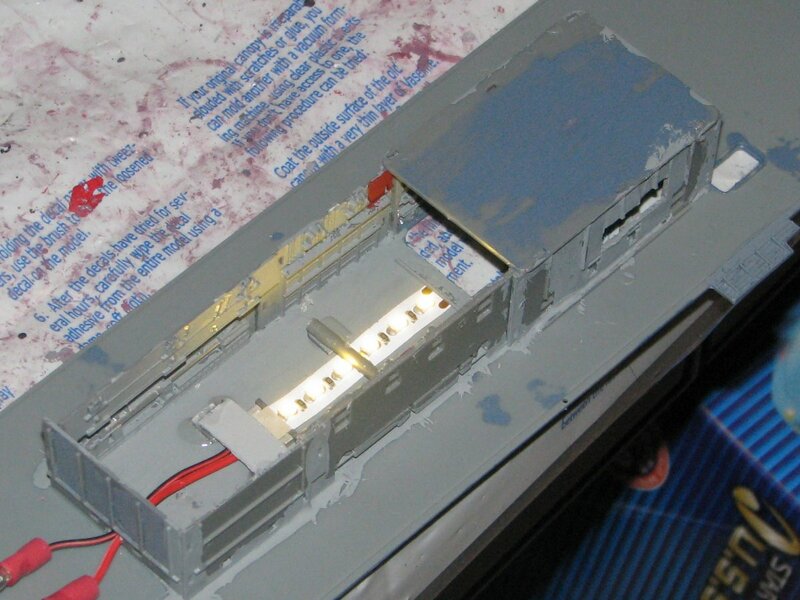 First, I needed to wire the lighting system to a switch box I would place in conjunction with the stand. The stand that comes with the Fujimi Hyuga does not really lend itself very well to that so I decided to simply wire it into a small box and place the switch on that. 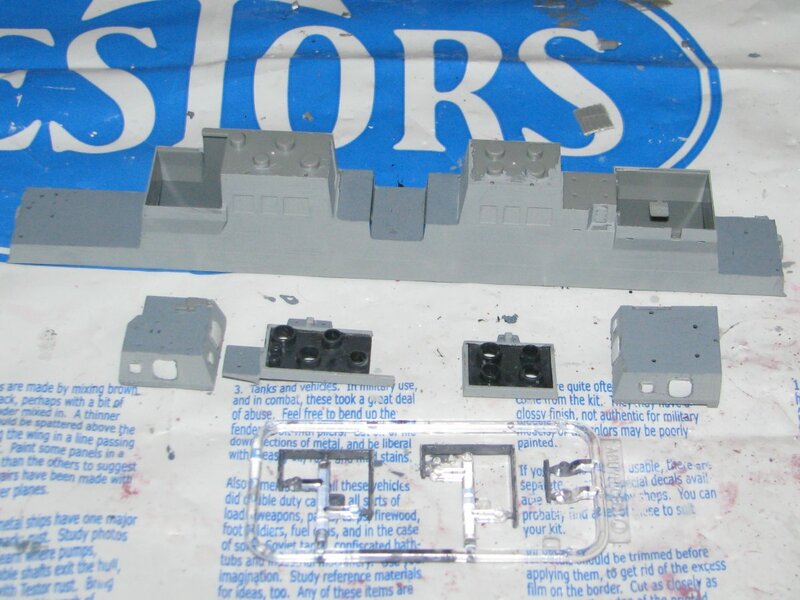 Here's the pictures of doing that, along with a picture of the Modern 4 and 5 Rail Photo Etch set in 1/350 scale by Tom's model Works that I used for the railing after completing the switch box. So, that's the Japense Ship (JS) Hyuga, DDH-181 of the Japanese MAritime Self Defence Force. Now it's on to to the initial escorts for her before moving to the French Carrier Group. By Sep 31, 2013: Complete the JMSDF Kong DDGs, Takanami DDG and a single SSK. By Nov 30, 2013: Start the French Carrier Group centered on Heller's Charles de Gaulle with two DDGs and an FFG. By Jan 31, 2014, Start the Russian Carrier Group centerd on Trumpeter's Kuznetsov with two DDGs and an SSN. By Mar 31, 2014, Start the US Navy Amphibious Ready Group centered on the Gallery USS Wasp with an LHD, an LPD, a DDG, a SSN and a LCS. 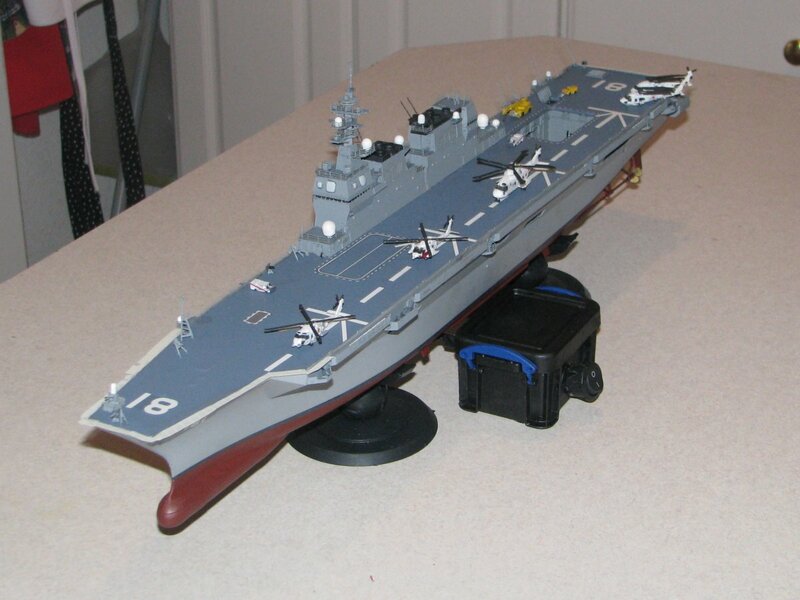 The completion of the PLAN Carrier group, centered on the already completed Trumpeter's 1/350 scale PLA Navy's Aircraft Carrier CV-16, Liaoning, (in addition to the other escorts already completed) included Mini Hobby's's PLAN Guangzhou, DDG-168. 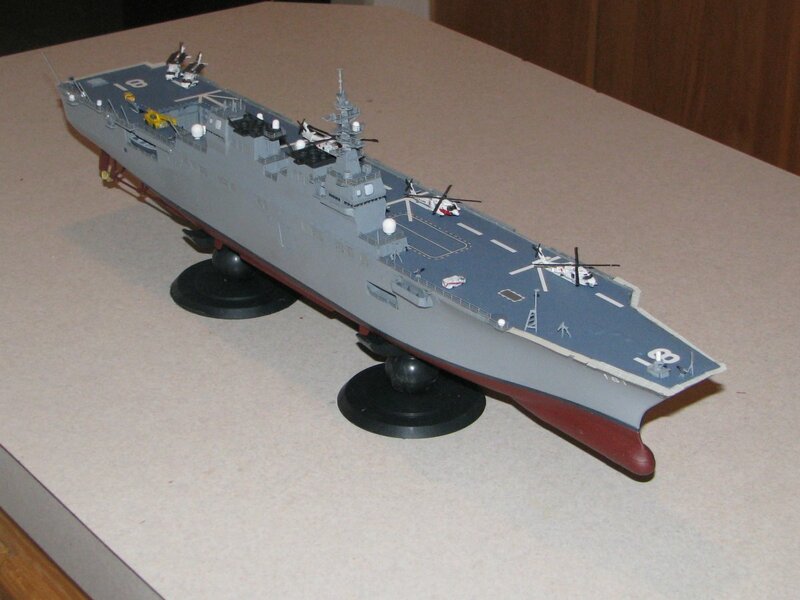 I recently pre-ordered a 1/350 scale model of the PLAN Type 071 LPD, Yuzhao Class, announced by Trumpeter and due out in October, 2013. I will end up adding two of those, propbably LPD-998 Yuzhao and LPD-999, Jinggangshan, add the PLAN- DDG-139, Ningbo, and the PLAN DDG-115, Shenyang, along with the PLAN Weifang, FFG-550 and thus build a PLAN ARG. The completion of the US Carrier Strike group, centered on the completed Tamyia's 1/350 scale USS Enterprise, CVN-65, (in addition ot the other escorts already completed) included Trumpeter's, USS Freedom, LCS-1, Dragon's USS Preble, DDG-88 and Hobby Boss's USS Texas, SSN-775. When a 1/350 scale USS Enterprise, CVN-80 (or any Gerald R. Ford Class) is released from Trumpeter, Tamiya, Dragon, or whomever else, I will add it to this group along with another AEGIS Cruiser. Whichever Ford Class coms out in 1/350 scale, I will build it as the USS Enterprise, CVN-80. The US ARG will include Tamiya's 1/350 scale, USS Iowa, BB-62 (which I have already completed), Trumpeter's 1/350 scale USS Iwo Jima LHD-7, Gallery's 1/350 scale USS Sommerset, LPD-25, Bronco Models 1/350 Scale USS New York, LPD-21, Cyber Hobby's USS Independence, LCS-2, Acadamy's 1/350 scale USS Rueben James, FFG-57, and another Flight IIA US AEGIS class detroyer based on Trumpeter's 1/350 scale USS Lassen, DDG-82...all of these models which I already own. 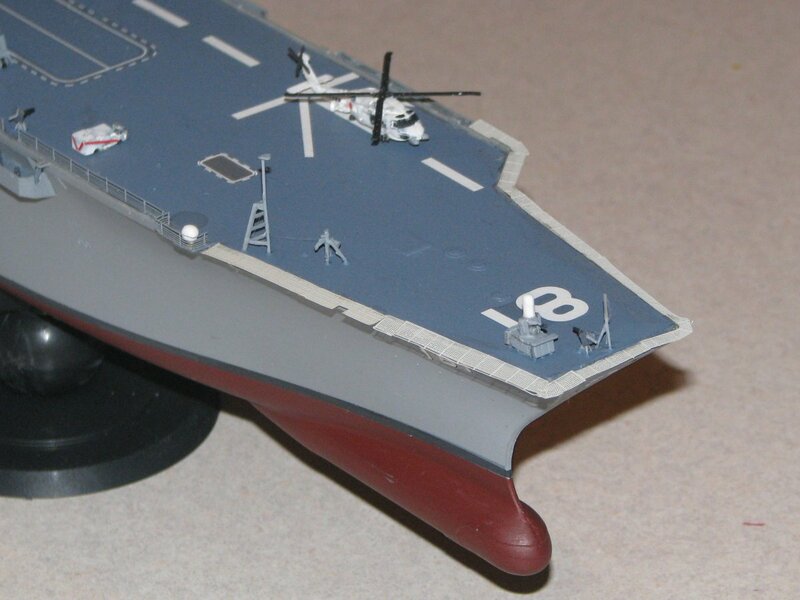 The UK Group is (as shown) featuring the Airfix 1/350 scale HMS Illustrious as its centerp[iece until a 1/350 scale Queen Elizabeth carrier is released. When that happens, I will add that carrier to the group as its centerpiece. The Roylal NAvy CSG will also include two Airfix 1/350 scale Daring Class DDGs (one of which is already completed), two Trumpeter 1/350 scale Type 23 HMS Duke class Frigates (one of which is already completed), and the Hobby Boss 1/350 scale HMS Astute SSN (which is also already completed) and Airfix 1/350 scale HMS Tragalgar SSN. 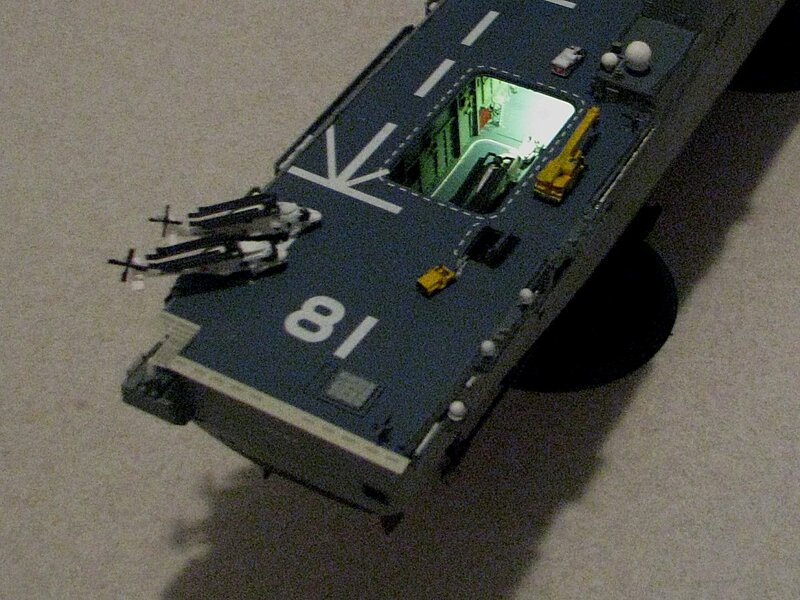 One day, when a 1/350 scale HMS Ocean LPD come out, I will use tt to start building a Royal Navy ARG. The French CSG will be centered on Heller's 1/400 scale Charles De Gualle (which I already own). I have purchased the 1/400 scale Heller French De Grasse, D612 DDG, which is an ASW DDG, the French Duquesne, D603 DDG which is an anti-air multi-purpose DDG, and the French Aconit F713 FFG and Gueprattet F714 FFGs, both of which are Lafayette class frigates. These five vessels will round out my French CSG. As soon as a French Robin class nuclear sub, like the French Perale S606 SSN is released in 1/350 or 1/400 scale, I will add that to the group. Also as soon as the Forbin D620, Horizon class anti-air DDG is released in 1/350 or 1/400 scale, I will purchase two of them and replace the De Grrasse and Duquesne with them, and then save those two for when a Mistral Class LPD is released in 1/350 or 1/400 scale so I can create a French ARG with those vessels. 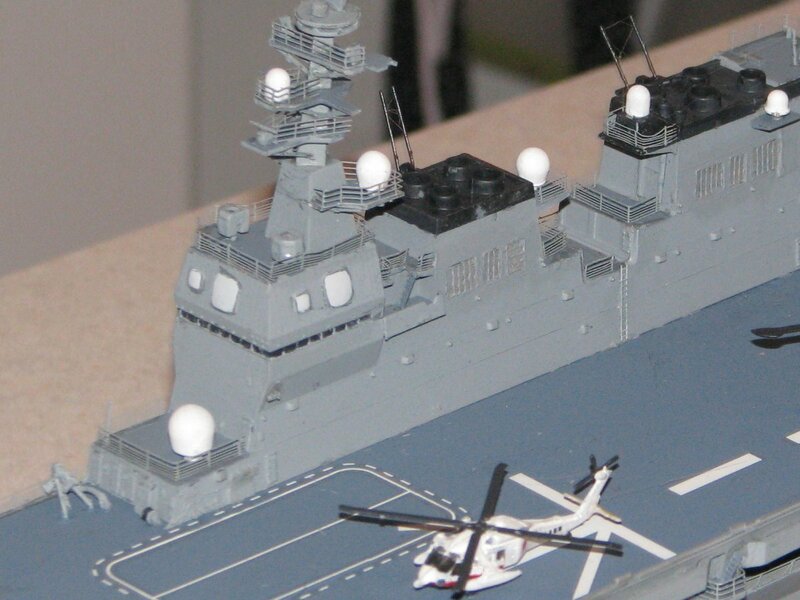 The Japanese JMSDF group will be centered on Fujimi's very finely detailed, 1/350 scale Hyuga, DDH-181, which I own. It will be escorted by Trumpeter's 1/350 scale DDG-177, Atago, an AEGIS class DDG and the JMSDF, DDG-174, Kongo class (which I own), Trumpeters's 1/350 scale DDG-114 Susunami and DDG-111 (both of which are Takanami Class DDGs which I own), and by the 1/350 scale SS-503 Hakuryu (which I own), one of Japans new, very modern and capable AIP Diesel Electric submarines. As soon as a DDG-115 Akizuki in 1/350 scale is released, I will add it to this group. 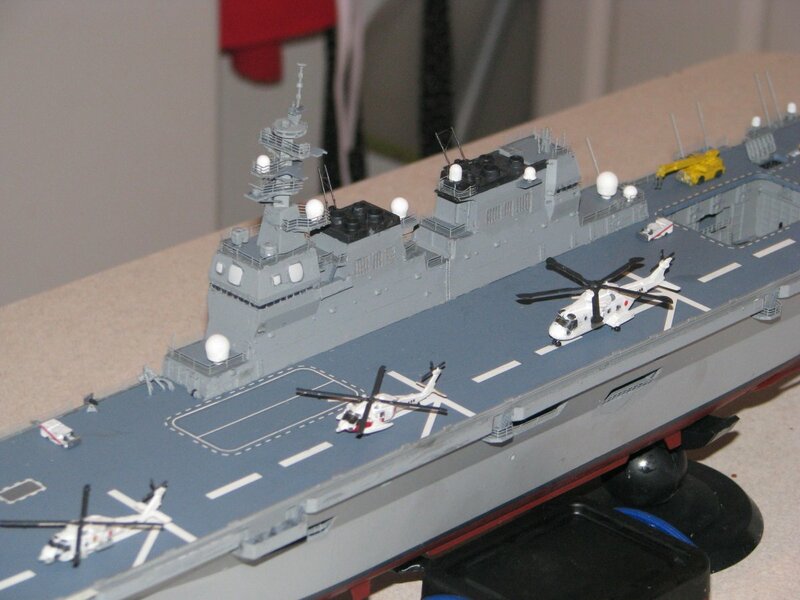 Should a 1/350 scale Osumi Class LPD be relased, I will buy two of those vessels and create a JMSDF ARG. Then, finally it will be a complete Russian CSG (centered on Trumpeter's Kuznetsov which I own) the Russian Slava Class cruiser, Varyag by Trumperter (which I own), two Trumpeter 1/350 scale Udaloy DDGs (which I own), Hobby Boss's Akula II class SSN (which I own), and the new Yasen class Russian SSN which I own in 1/350 scale. 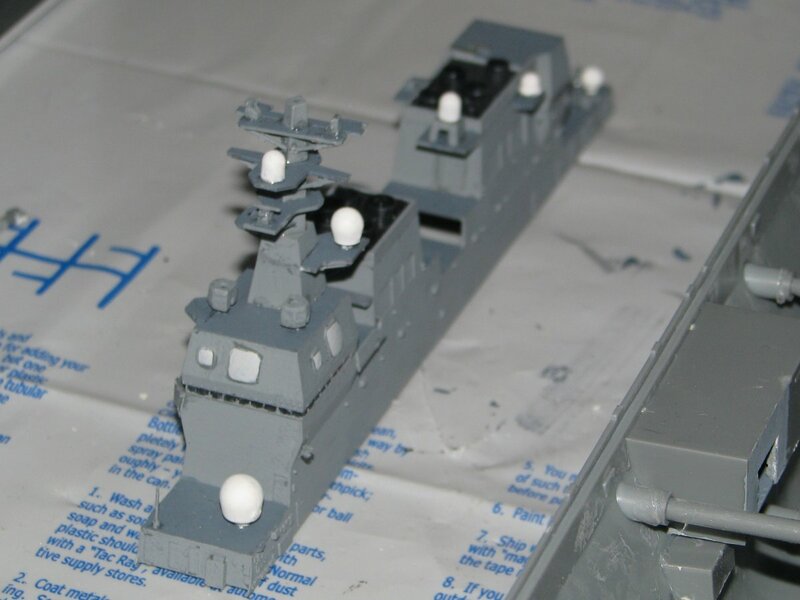 Some time in the more distant future when a 1/350 scale Russian version of the French Mistral class comes out (which is building in real life right now), I will add two of those and build a Russian ARG. Recently I purchased Heller's 1/400 scale Foch, the Clemceau Class carrier that was sold to the Brazilians in 2000 and in 2002 was refitted and became the Brazilian CV, Sao Paulo, using steam catapaults. 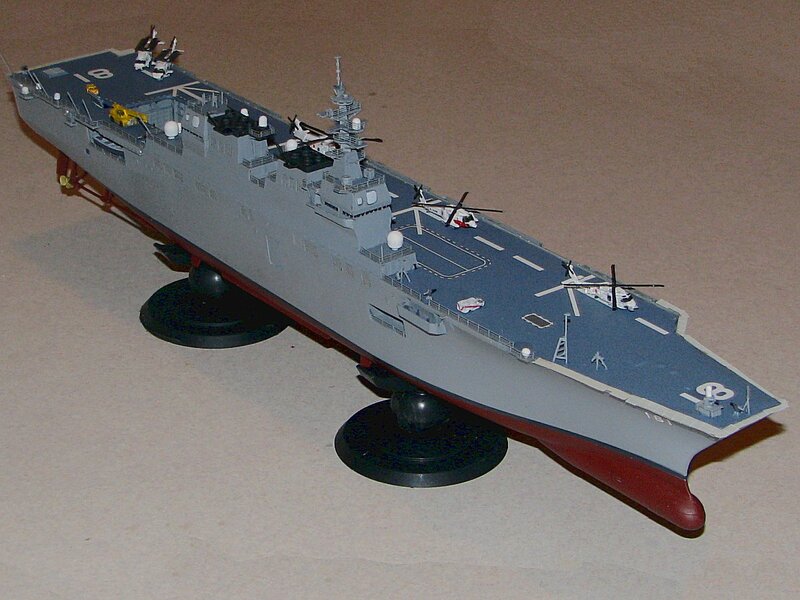 I will build the model as the Sao Paulo and thus start a Brazilian group, though the Type 22 DDGs and the FFGs the Brazilians use are not available at present. I have however purchased a set of 1/400 scale A-4 Skyhawks and S-3 Trackers to build a suitable airwing for the Sao Paulo. Then, again, once the models are available, I'd like to build an Italian Carrier Strike Group centered on the Cavour and their Horizon DDGs, a Spanish Carrier Strike Group centered on the Juan Carlos and their F-100 AEGIS FFGs, and ultimatly an Australian Strike Group centered on the new Canberra Class LPD and the Hobart class AEGIS DDGs. If they ever build the models, an Indian Carrier Strike Group centered on either the Vikramaditya or their new ADS Carrier, the Vikrant, and their Kolkata class DDGs and Shivlak class FFGs would also be nice. Years more worth of work!